Versatile, portable, and lightweight, the BM3 patient monitor is specially designed to be reliable and user-friendly. The compact design, coupled with a unique handle, makes it easy to move from room to room. 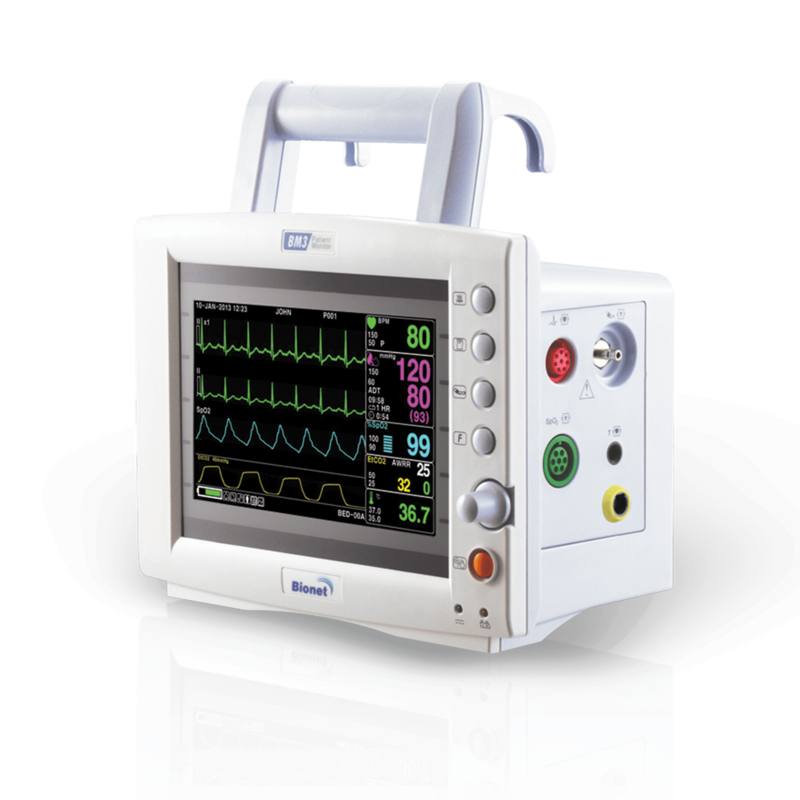 Its 7″ widescreen color monitor displays all the vital signs in different colors for easy recognition. Versatile, portable, and lightweight, the BM3 patient monitor is specially designed to be reliable and user-friendly. The compact design, coupled with a unique handle, makes it easy to move from room to room. Its 7″ widescreen color monitor displays all the vital signs in different colors for easy recognition. A built-in printer offers hard-copy documentation of all measured values, as well as up to 3 waveforms of information. Alarms and settings are easily adjustable and are retained after turning off the power. Plug-and-play side or mainstream EtCO2 sensor can be added at any time. Compatible with EMR via HL7 protocol. • ECG, SpO2, NIBP, respiration, temperature*, EtCO2*. • 7″ color TFT LCD for a clear view. • Individual sweep speed setting for each parameter. • 128 full hours of trend data stored. • SpO2 measurement with every low perfusion detection and pulse beep. • External VGA Output for large screens. • Li-ion battery (1.5 hours of continuous operation). • Enhanced input impedance for dry skin or electrode patch. • Graphical and tabular trends. • 20 cases – 10 sec. alarm waveform stored, reviewed and printed. • Compatible with EMR via HL7 protocol. • Li-ion rechargeable battery allows cordless use for up to 1.5 hours. • Less than 3kg (7 lbs), including battery. BM3 Main Unit, 3 Lead ECG Cable (snap type) and ExtensionCable, SpO2 Adult Finger Sensor and Extension Cable, NIBP Adult Cuff (arm circumference 25-35 cm) and ExtensionTube, Chart Paper (x2), Power Adaptor & Hospital Grade Power Cord, Operation Manual, and 4-Year Warranty Card. *Temperature probe and EtCO2 accessories purchased separately. Swap speed: 6.25, 12.5, 25, 50 mm/sec. 80 Thermal Printer Speed: 25, 50 mm/sec. 95 Sweep Speed 6.25, 12.5, 25, 50 mm/sec. The Video of BM3 will be coming soon.